The first Monument of the year and the last chance for the sprinters to win before more hills are added to the route. Sunday’s Milan-Sanremo is all about the tense finish, the paradox of an unpredictable race yet it’s almost always won by a one of the best riders going. Who will keep their nerve? The Route: exit Milan and the race speeds across the vast Po valley and the Pianura Padana, the plains that grow much of Italy’s rice crop. Ovada is the town marks the start of the long Passo del Turchino. This mountain pass used to be important to the race but it’s a slow and gradual climb, the road is tracked by a railway line, a clue to the gentle gradient. Turchino means a shade of blue in Italian, hinting at the Mediterranean sea that awaits on the other side. The pass is a symbolic moment, lifting riders away from the foggy plains towards the shimmering spectacle of the Mediterranean, although the weather isn’t going to be so poetic this year. The race drops down to the coast via more tunnels to the outskirts of Genova and the stress ratchets up. The halfway point is crossed but the finish feels closer, the coastal road is familiar. The race goes from one town to another, negotiating modern street furniture and antiquated town squares alike. In time comes the cape trinity: Capo Mele, Capo Cervo and Capo Berta. These are small climbs but serve as landmarks to break up the flat road and by now the race has done 250km. Then it’s on to the Cipressa. This starts with sharp right hander and quickly climbs through olive groves above the coastal town of San Lorenzo, the nine percent gradient bites hard after 270km. This is a proper moment of climbing that can prove fatal for the sprinters, the average of 4% is a blend of a steep start and, after crossing the autostrada, a flat portion over the top where dropped riders flounder. Television cameras often follow the back of the peloton to catalogue the dropped riders because the toboggan-run descent, the most technical part of the course, is often too fast to film in full. 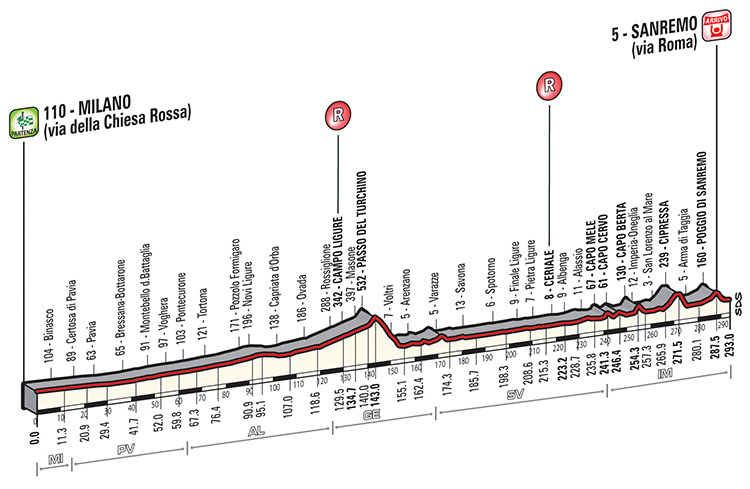 The Finish: the Poggio starts with 9.2km to go and marks the final phase of the race. A furious pace is inevitable. A right flick off the main coastal road is followed by series of wide bends that are so fast some riders have to brake despite going uphill. Positioning is everything as the road winds up, every metre matters. Unlike the Cipressa this isn’t steep, there’s only one short step at 8%. But after 285km the elastic is like an old rubber band and the Poggio is just enough snap the peloton. The descent is fast and marked by a series of curves and five hairpins. The race has been won on the descent before and it has its technical moments, for example knowing which bend has the sunken inspection cover on the exit line helps but it is really a very physical effort, a series of sprints out of the corners. Carrying speed into the bends matters but what makes the difference is being able to pump out big watts on every bend exit after 290km. The ramp ends with fast junction onto the main road and it’s left at the fountain, then right on the Via Roma, the “old” finish, sloped with the slightest of slopes up to the finish line. The Scenario: a bunch sprint? If only it was so simple. The chart above shows the size of the front group in Sanremo. All the blue bars represent the Cipressa-Poggio combo while the grey ones represent the harder years with the climb of Le Mànie. The takeaway is that a “bunch” sprint is really a reduced group, a selection of 20-40 riders over the Poggio. We’ll see an early move go clear. Look to see which teams place riders in it and if there are any big engines in the move to keep it clear for as long as possible. As ever the pace ratchets up along the coastal road, on TV you might see a bunch of riders, the trick is to spot which teams still have plenty of riders and how well each rider is paced. Onto the Cipressa and long range moves are hard but the harder the pace the more the sprinters will struggle. It’s got some steep sections and it’s easy to crack and then lose 30 seconds over the flat section to the village of Cipressa, game over. There’s always a danger moment on the flat section to the Poggio as a move can slip away while others get into position. The Poggio’s early slopes can look slow on TV but chances are the bunch is going full gas only space is at a premium and the riders are packed tight like sardines. The best attacks came late on the steepest part and a breakaway only needs 10 seconds over the top to stay away. With the return to the Via Roma there’s less time to pull back a move but the wide, straight road also encourages the surviving bunch to chase any fugitives all the way to the line. 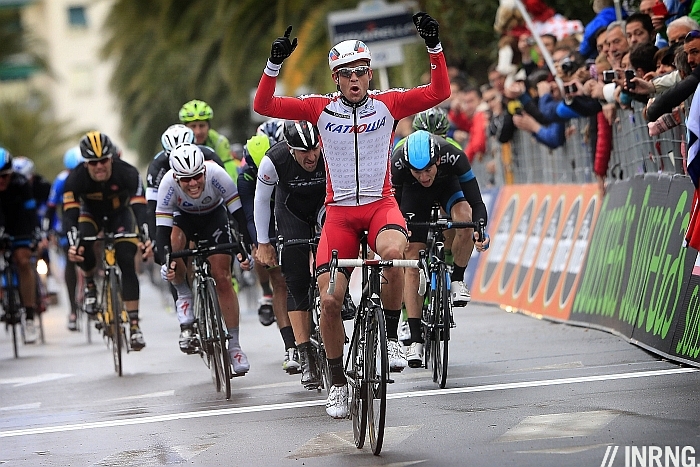 The Contenders: Alexander Kristoff is the prime pick. He’s got a very powerful sprint and crucially he’s strong in the toughest races and on the hardest of days. Sanremo could end in a sprint but it’s a test of brute force rather than sheer speed and that’s how the Norwegian ogre can win. It’s said he trains with punitively long sessions on the wet coastal roads of Norway. This was all visible last year and now he’s started 2015 even better than before with a series of wins. His Katusha team are solid and ready to work for Plan K. Alexander Kolobnev seems the odd one out amid the sprint train wagons but he could be tasked with marking moves on the Cipressa. Kristoff’s weakness is his strength, his sprint all about long range power rather than a sudden flourish in the final 50 metres. There will be a scrap to get on his wheel. Mark Cavendish is the next choice. The Briton’s contract is up at the end of the year and he’s picked this race as the best way to boost his market value, spending winter training for Sunday and shedding weight to float over the Cipressa. But he’s been ill of late, a virus struck about two weeks ago. He looked solid in Tirreno-Adriatico, more than could be said of his chainring which flexed in the sprint and dropped his chain. The sprint will be interesting, can Cavendish have a full lead-out from Etixx-Quickstep in Sanremo? Probably not so he might be the first in the queue on Kristoff’s wheel but we’ll see who is left over the Poggio. Team mates Zdeněk Štybar and Michał Kwiatkowski can have their cards to play too, both are tempting options for a move on the Poggio, especially as Kwiatkowski’s demon descending can help on the Poggio. Peter Sagan is next, he’s been tipped before but has deceived. His problem is how to beat Kristoff and Cavendish in a sprint, he’s patently not as fast in a straight line but if you could run a sprint into Sanremo again and again the configuration could change, plus he’s able to go clear on the Poggio if the tactics require it. He’s in form and feeling the wrath of team manager Oleg Tinkov. John Degenkolb is a prototype winner, a fast sprinter with the added endurance and hustle to benefit from the climbs that eliminate or blunt his rivals. He comes as sole leader of Giant-Alpecin but his form hasn’t looked so sparkling of late, an excellent sixth in the Paris-Nice prologue shows the ability but his best during three sprint stages in France was one third place which doesn’t translate into a win. Fabian Cancellara has been second or third for the last five years, a superb record. Can he keep it up? His riding in Tirreno-Adriatico says yes but he’ll have to put his power to use on the Poggio to thin the field. He can win on the descent, taking a few seconds on each bend is enough to see him slip away. Trek Factory Racing also have the in-form Giacomo Nizzolo for the sprint. Greg Van Avermaet has found winning ways after his triumph in Tirreno. One problem for Sunday is the flat finish isn’t ideal. He can finish very fast but he’s not going to beat Kristoff, Cavendish et al in a straight sprint. So he’s likely to go on the Poggio. Another problem is that his own team mate Philippe Gilbert is the master of the uphill attack on a climb like this, the two work together but are not best friends, Gilbert’s attack could prevent Van Avermaet’s move although Gilbert is capable of the win. Michael Matthews has been training for this day and has the knack of delivering on the big occaisions. But how? He is quick in the sprints and has some handy workers who he can count on for a leadout like Simon Clarke and Daryl Impey. Watch to see if Orica-Greenedge try to lift the pace on the Cipressa to asphyxiate the heavier sprinters. 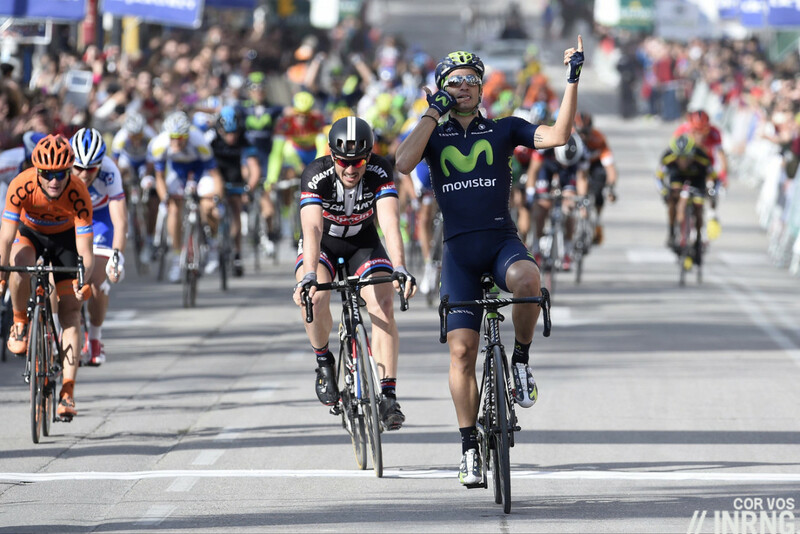 Movistar have two interesting options in Alejandro Valverde and Juan-José Lobato. Valverde can go on the attack and even sit on the wheels knowing Lobato is waiting for the sprint. Both are in form with Valverde among the best on the Strade Bianché while Lobato was a level above John Degenkolb in the Vuelta Andalucia although he didn’t look so invincible with fourth place in the recent GP Nobili. Team Sky can play similar tactics with Ben Swift for the sprint, perhaps with a lead out from Luke Rowe while Geraint Thomas can be used in a breakaway bid and Lars Petter Nordhaugg was with the best on the Poggio last year. Swift has been training hard for this race after coming so close last year. 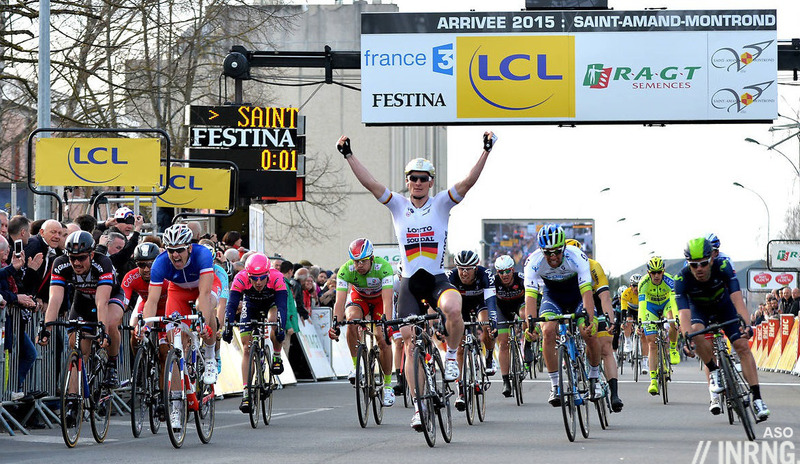 André Greipel won a stage in Paris-Nice. He’s 32 and it’s about time he got a big win as he’s at ease on these climbs and comes with a strong team. Tony Gallopin used to win bunch sprints with Cofidis so he’s quick too but could be a stealth option to slip away although after his Paris-Nice performance nobody will give him much room. Jurgen Roelandts would be an outsider but is recovering from illness and had a quiet Tirreno-Adriatico. Vincenzo Nibali rides but his heart doesn’t seem in it and the course won’t suit. Everyone thinks he’ll try an attack on the Cipressa but his form isn’t scintillating and his acceleration could be prove fatal for team mate and sprinter Andrea Guardini. “Flash” has had a great time in Malaysia and can beat the biggest names in a sprint but the Via Roma isn’t about surging accelerations, Guardini’s trademark. Lars Boom is a name to mark on the Poggio, especially the descent. Lampre-Merida have a re-motivated Filippo Pozzato, strong in the recent Tirreno-Adriatico but it’s hard to see him barging away on the Poggio and then driving the breakaway, maybe this is better for Rui Costa. Davide Cimolai brings a sprint option, as does Niccolo Bonifazio. French rivals Arnaud Démare and Nacer Bouhanni each have an outside chance. FDJ’s Démare packs a powerful sprint and the long finish suits him, just as long as he can get the right wheel or be delivered into place. Meanwhile Cofidis’ Bouhanni has been training hard for this race too with visits to recon the course, he’s not done it before so expectations should be set low even if he can climb the Cipressa and Poggio and then find his way to the win in a scrappy sprint. FDJ’s Johan Le Bon is coming good. If the race is likely to end in a sprint then MTN-Qhubeka have their bases covered with five sprinters. Matthew Goss is a past winner but hasn’t been visible in sprints this year. In-form Gerald Ciolek is a better bet. Edvald Boasson Hagen is the enigma, he’s often run out of steam in races beyond 200km but a return to old coach could help while Kristian Sbaragli is fast and good on home soil. Ramūnas Navardauskas probably isn’t on the tip of your lips but he’s an outsider. He’s got a few placings in sprints thanks to his long power. He leads Cannondale-Garmin who are still searching for their first, in fact their first World Tour ranking point. Nathan Haas has some speed for the finish too. Among some other names, Bardiani-CSF bring Sonny Colbrelli, a cheap version of Peter Sagan and that’s a compliment. Ditto CCC-Sprandi’s Grega Bole, in form and with a strong sprint. 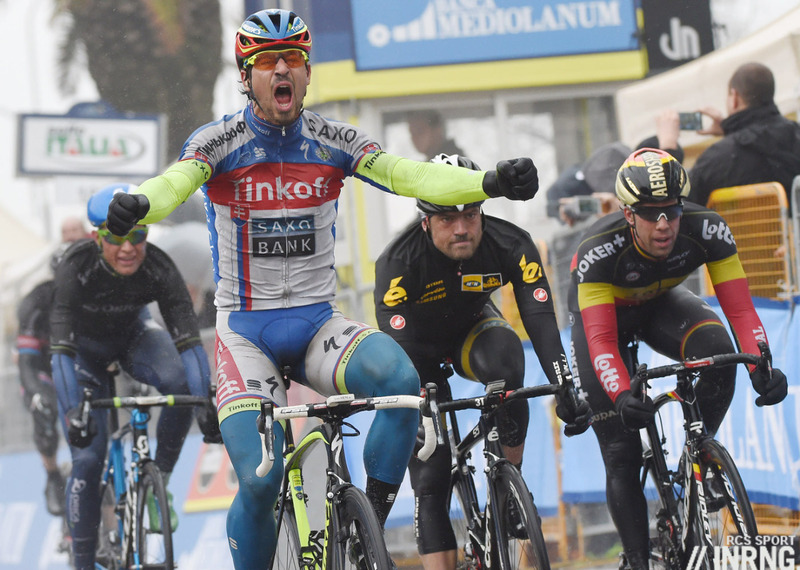 The problem for all these lesser names is that Milan-Sanremo rarely smiles on the outsiders. Heinrich Haussler is still searching for the form he had in 2009 while IAM Cycling team mate Sylvain Chavanel is strong, he’s been working on his sprint but will probably go in a longer range move, perhaps in between the Cipressa and Poggio. Bora-Argon 18 have Sam Bennett for the sprint but this a voyage of discovery; Jan Barta and Bartosz Huzarski are good bets for the early breakaway. Quality first: we don’t know what will happen but usually once it’s happened we knew the result was inevitable. What? It’s the paradox of an open and unpredictable race yet the winner is rarely a surprise. Almost without fail the result is very satisfactory, glance at the list of previous winners and it’s packed with quality, with one or two exceptions every single winner in recent times has been among the very best in the world. Weather: rain turning to showers for the afternoon on the coast and a top temperature of 12°C. There will be a 20-30km/h NNE wind meaning a (three quarter) tailwind along the coastal section and multiplying the chance of crashes. TV: the race starts at 10.10am CET. Italian TV starts coverage at 2.30 pm CET with most international coverage too. For many English-speaking readers, US viewers have BeIn Sport, UK is Eurosport and SBS in Australia. The finish is expected for 5.10pm Euro time but with a large margin given the distance involved. Part of the experience is watching the race build so tune in early if you can. The Capo Mele is scheduled for 3.50pm. The final hour is crucial with the capes and the hills. As ever steephill.tv and cyclingfans.com are the go-to sites for TV schedules and feeds. Sanremo or San Remo? Both. Ride into town and you’ll see signs saying “Sanremo”, arrive by train and the station says “San Remo”. Will Sagan finally break through and win a long awaited Classic. Can Kristoff repeat? Will GVA, Matthews or Thomas give it a go? Shaping up to be one heck of an afternoon in San Remo..
Sagan will have a stronger team – so that should mean he won’t need to show himself too early (2nd half of Poggio?). Last year de Marchi did a great job… but this year i would assume Basso / Krueziger to keep the pace super-high on the Cipressa… maybe even the Poggio too. The problem for Sagan is that he is too good at everything but not spectacular at anything. As a pure sprinter he could put he eggs into the bunch sprint basket and the team has simplified instructions to get him to the finish still in contention. As a rouleur/punchy climber he would know that a jump on Poggio is the only way, and settle for at least attacking. As it is, i think he’s often caught in two minds whether to stick or twist. In 2013 he followed on the Poggio, and did some turns to the final sprint.. Ciolek benefiting after largely being anonymouus in that front group. In 2014, he was explosive with de Marchi, but then caught in the wheels behind the BMC and Katusha leadout, without the legs for a sprint proper from 6-7 rider lengths down. Curious to see what is going to be PlanA for Tinkoff-Saxo. The Van Avermaet/Gilbert non-friendship: is this personal or does it come from the fact they’re pretty similar types of riders who might want to target the same races? I know Gilbert wants another crack at the cobbled classics but BMC is backing GVA for those races. Last year it seemed that until Van Avermaet’s chain fell off the two were working well together so maybe they can do so again. As for Goss, he’s not been springing for himself of late, he has been doing lead outs for Ciolek and Farrer in T-A, a role he did quite well in, as I’m sure most recall, for HTC-Highroad and Cavendish. Even his 2011 MSR win was a case of the team going for plan B on the day, getting the nod when Cav wasn’t up to it. A bit of both. GVA left Lotto for BMC so he could ride more for himself. Only for them to sign Gilbert. They were having a little catfight back in the day with little snipes given to the press about who is not deserving of leadership in the team, and who acts like a prima donna. No points for guessing who said what about the other. They seem a lot better at working together these days though. Gilbert absolutely buried himself for GVA at the end of the Worlds. Their behaviour in last year’s final was peculiar, to say the least. Gilbert seemingly leading out Kristoff, with GVA sprinting more or less in parallel. GVA’s gears skipped and jammed during the sprint. He might have won the race otherwise. Excellent preview for the first REAL RACE of 2015! You wrote “last chance for the sprinters to win before more hills are added to the route.” while what we’re hearing in Italy is the opposite, most recently from Beppe Conti last night on RAI’s Radiocorsa. Did I miss something? Yes, yes, yes! Milan Sanremo IS the first proper race of the year and is always my favourite. My daughter has chicken pox, I’m hoping this means over to watch it in full. Different context (not only national team but also the fact that Gilbert already has a rainbow jersey), but he buried himself for GVA in the closing stages of last year’s WCRR. I remember that, good point. Perhaps Belgium is big enough for the both of them even if BMC isn’t…. 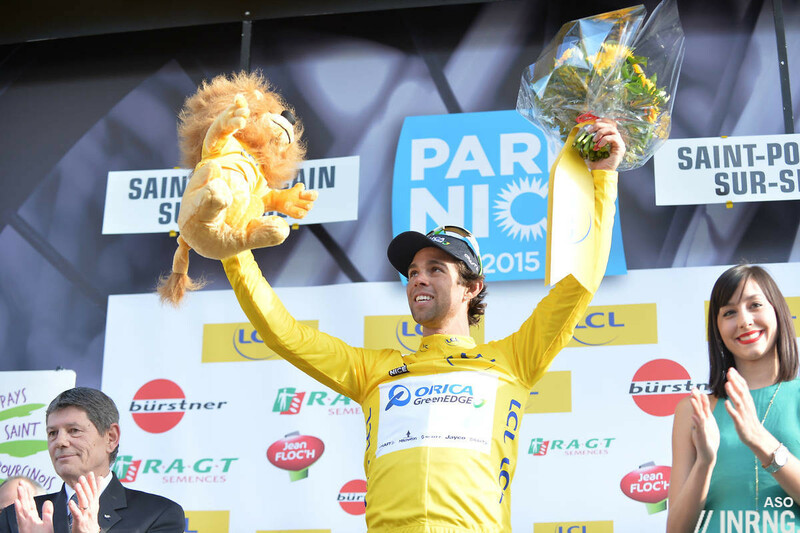 Do you think Paolini is enough for Kristoff to win knowing the numerous attacks by Etixx, Movistar, Trek and Lotto? It was last year. The difference between Paolini and the domestiques for Ettix (Stybar an exceptional exception), Movistar, Trek and Lotto is that Paolini will still be there all the way to the end, whilst the others are an iffy proposition. Lest anyone forget, Paolini has been on the podium of this race 300 years ago when he was just a young’un, a bonafide dark horse bet. Thanks, as always. Really liked the bar graph, fascinating. “With the return to the Via Roma there’s less time to pull back a move but the wide, straight road also encourages the surviving bunch to chase any fugitives all the way to the line”. It’s not 1km less (as I myself happened to think/read/write), it’s 500m. About 35″ shorter, which in theory means around 4″ extra allowance for the breakaway. Practice may be a bit different, though, since a couple of bends more in the Italo Calvino route implied a slightly lower top speed (which was good for the break) and the curving line of even apparently straight roads (like corso Bixio) often prevented direct eyesight. That said, Via Roma is traditional, riders say they like it, hence ok.
I’d just prefer Vegni wouldn’t try to sell it as a huge bonus for the attackers, that will possibly compensate for the lack of Le Manie… because it isn’t. Well, I will go with Oscar Freire… It’s the wind who decides if the break after the Poggio stays away or not. I love the angle and timing of that first photo. Surprised no MTN riders even got a 1-chainring listing. For sure, but that doesn’t mean the winners are usually among the favorites. For Kristoff and Gerrans, the MSR win is what launched them into the upper echelons of road racing. Neither one were considered among the truly elite contenders until after they won MSR. For example, last year Kristoff was considered “the rider who might pull it off if the weather is bad”. Gerrans had only one one-day win of significance before his coup. Meanwhile, Goss and Ciolek were one-star mentions at best. Throughout most of the 2000’s, though, you are right. I’m just not so sure the race isn’t changing a bit; perhaps the burden of favoritism is becoming heavier as the overall quality gap in the peloton decreases. I bloody love this race! Excellent and exciting writing here, thanks for the awesome preview! Hope to catch the race, but my riding pal is able to record it (not me) and wants to roll at 10 EST on Sunday. As great as the race is, I can’t pass up a Sunday spin on the first weekend of spring. Plus, local college criterium around downtown, past a few bars in the afternoon. Argh. Might have to miss the race live, ignore the news, and watch a replay. I call Cancellara 2nd or 3rd at best. Everyone knows you *have* to follow his attack. My podium hopefuls are Boom and Stybar only because I blindly favor ‘cross riders in the classics. Boom is overdue for a classics win and Stybar can win it now that he appears used to the distances. If Cavendish makes it to the 1KM flag in the first group, then he’s your winner. Well, Cavendish made it to the 1KM flag in the first group last year, but didn’t have any chances against Kristoff. I am interested in the the bar graph showing the relationship between the number of riders in the first group to finish and whether (blue) or not (gray) there is a straight-up Cipressa-Poggio combo. There is a reasonably high probability (t = 1.36, df = 19, P = 0.19) of getting this distribution just by chance alone under the null hypothesis that there is no difference between colors, suggesting there is nothing suggestive in this graph. However, such count data as these better approximate a Poisson not a Gaussian distribution and should be analyzed appropriately, suggesting a real difference between colors (Poisson regression: Z = 5.25, P < 0.001). Although one could argue that the small sample of gray years combined with their being completely clustered temporally renders any such analyses dubious, I am going with a large bunch finish, but I am hoping for a small break on the Cipressa that is reduced to 1-3 on the Poggio. Keith, don’t be a buzz kill. Thanks Inrng always so tight, colorful and readable. Sagan’s value does seem to be inversely/proportional to the size of his paycheck. Many ways this race could play out, will be fun. Or, Sagan is **heavily** marked probably as much as a Cacellara or Boonen. This is the team aspect of the sport that is so great and really works in one-day races. I think all pro bike riders are tough, I think classic riders take that toughness to another level and then persistent world level winners are an exception that we all call ‘world class’. After reading yet another excellent piece of cycling information from your blog I have to say my bones are tingling for the new season and I expect Cavendish to win. Thanks for your expert delivery on all things cycling related. How many seconds do you think the Poggio climb attackers will have on the favored sprints? 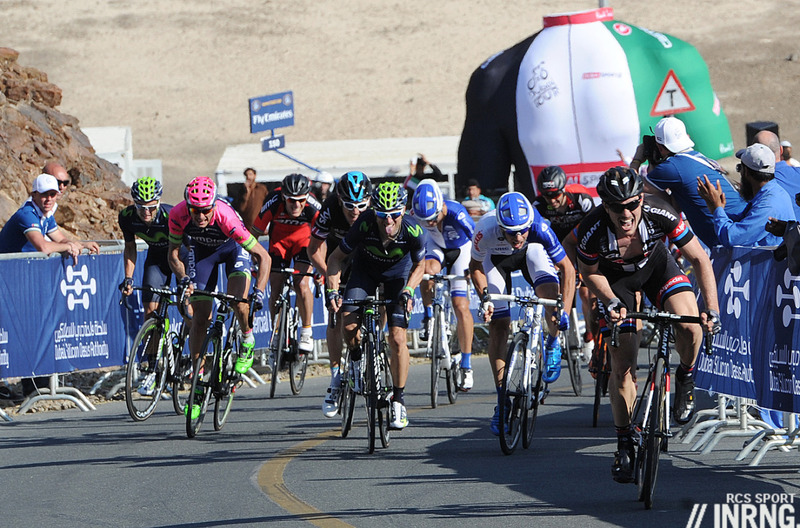 Do you think 20 seconds is enough for the them to hold the peloton until the finish line? Five seconds were enough for Cancellara, Nibali and Gerrans in 2012. The descent is part technical, part a series of intervals, the ability to attack out of each corner. The powerful rider in the lead has the advantage over the gregario trying to chase for his team leader. If we the Poggio breakaway consists of more than 8 cyclists, you see the finish will not go to Sprint? Sagan has a real shot at this. ‘San Remo’ is a hangover from the fascists renaming the town in the 1920s. In 2002 it was reverted to Sanremo, named after a 4th century bishop. Sagan’s form is hard to call, the sprint he won at T-A was after potential rivals had climbed off.this is a far bigger test for the million dollar nearly man. Thanks for another superb overview. Look forward to the final 40 kms. I do hope they are not going to use the head height barriers at the finish – always completely restricts the view unless you are two and a half meters tall. Television in a local café probably the best alternative, unless you have a decent bike you want to keep ! For me the best live-viewing option is this 6-step plan: 1) ride your bike down from Sanremo via the bike trail (the one that will be used for the Giro’s chronosquadra stage) 2) ride up the Cipressa and follow the course to the Poggio 3) have lunch here http://www.tripadvisor.it/ShowUserReviews-g194900-d4168219-r163642361-Il_Rustichello-Sanremo_Italian_Riviera_Liguria.html while watching the race unfold on their TV 4) dash out into the street to watch the race go past 5) run back into the trattoria to see the finish on TV 6) ride down to Sanremo and see the trophy presentation, etc. If the weather is decent it’s a perfect Sunday in Italy, especially if your guy wins! The Phoney Wars have ended, now it gets serious. Love that line about the inevitabilty of it all. MSR all over. Really not worried about the winner, just how the race unfolds.Although Kristoff looks good to be first rider since Zabel to win back-to-back editions, EQS have more options than most. Larry. Second your six step plan – have tried it many times myself. The only weak points are steps 1 and 6 ! For the last ten years there have only been a few Sundays when a ‘bike ride’ could be recommended. Looks as though Sunday will be no different. Best stay on the Poggio. We were fortunate in 2010. It was rainy on the Saturday (just like today?) but cleared up by Sunday morning, the roads were barely damp when we left Sanremo and almost totally dry soon after. The final phase is all I care. Everyone saves energy for the last minutes. Then, they push it like crazy. The decent makes it more furious. The curves are like serpents. Literally, it feels like some clever mind has put these curves intentionally. At this point, at such high speed, everything depends upon technical calculations. That’s the only way to get through it. Rest, I couldn’t understand even a word about what you guys have been talking about.